The vast majority of B2B marketers are now using content marketing to create brand awareness and generate leads. According to Content Marketing Institute and Marketing Profs’ 2014 B2B Content Marketing Report, 93% of B2B marketers now use content marketing and 78% of the “most effective” B2B marketers are creating more content than they created last year. Are B2B content marketers successfully engaging their target audience on LinkedIn? 56% of those who engaged with a Sponsored Update from a CRM lead management software brand influenced purchase decisions in their company. 66% of the DMs who engaged with a Sponsored Update were not currently in-market for a CRM lead management software (34% were in-market). 42% of the DMs who were in-market for CRM lead management software did make a purchase decision. 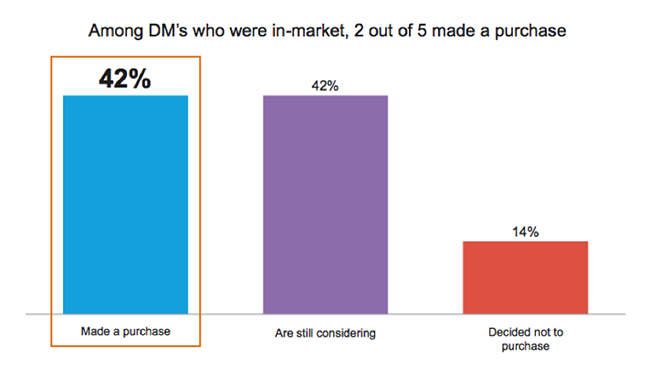 Engaging with a brand’s Sponsored Update on LinkedIn results in significant increases in awareness and consideration among DMs who are in-market. This was especially true for smaller “challenger” brands. In Q1 2014, seven of these brands ran Sponsored Updates campaigns in the US, with roughly 21,000 LinkedIn members engaging with one or more Sponsored Updates from these brands. We invited 10,000 of the “engagers” to take a short survey, resulting in a survey sample size of 950 LinkedIn members. 1. 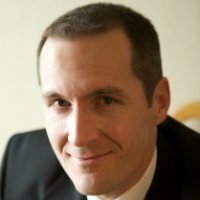 Are B2B decision makers engaging with LinkedIn Sponsored Updates? Of those who engaged with one or more Sponsored Updates, 56% influenced the purchase decision. 2. Are these B2B decision makers in-market? We found that 34% of decision makers were looking to buy at the time. We asked these ready-to-buy decision makers if their company made a decision to purchase a CRM Lead Management product and found that that 42% made an actual purchase. 3. Are B2B decision makers more likely to be aware of these brands? We found that engagement with a brand’s Sponsored Updates did in fact improve brand awareness, especially for the challenger brands. 4. Are B2B decision makers more likely to consider these brands? We found that engagement with a brand’s Sponsored Updates improved the likelihood of the brand being considered for purchase. 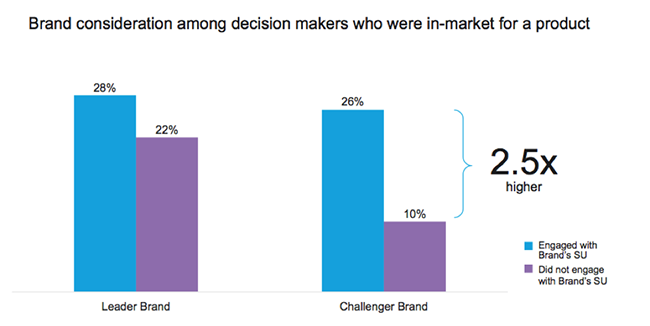 For the challenger brands, consideration improved significantly. For B2B marketers looking to increase awareness and consideration among in-market decision makers, this study offers good news. More information regarding the study can be found in the SlideShare presentation below. If you’re interested in learning more about launching a LinkedIn Sponsored Updates campaign for your company, we’re happy to help. Contact us today.